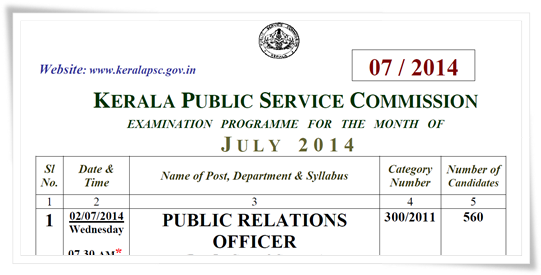 The Kerala Public Service Commission has published the exam calendar for July 2014 in the official website. Candidates can check and download the exam schedule which is currently available in PDF format. Complete details about various exams, syllabus and hall ticket details are also mentioned here. Candidates can visit Kerala PCS official website (http://www.keralapsc.gov.in/) for additional information. Kerala PSC has declared the details about 25 exams which are slated to be held in July 2014. If you are a candidate applied for any of the above exam can download the hall tickets from the official website of Kerala PSC. The preliminarily test consists of an objective type exam (OMR Valuation) based on the qualification prescribed for the post. It is very important to remember the following points while preparing for the exam. It should be noted that apart from the Main Topics in the Syllabus referred to in the examination calendar, questions from other areas related to the educational qualifications prescribed for the post might also appear in the question paper. All the topics cited under the sub head "Main Topics" may not be covered in the question paper. Along with the Identification Certificate attached to the admission tickets, candidates should produce the original of any one of the following documents to prove their identity during the time of examination. Voters Identity Card, Passport, PAN Card, Driving License, AADHAAR card issued by the Central Government. (Do check the official website of Kerala Public Service Commission to get the complete list of the identity documents). Those candidates who fail to produce the original identity proof will not be permitted to attend the examination. The examination time includes half an hour as preparation time for the verification of identification certificates and ID Proofs of the candidates who are appearing for the examination. How to score high marks for PSC exams? As most of youngsters aspire to get a job with the Kerala government, a well preparation is needed to fulfill the dream. Candidates who have given much seriousness in preparation should have a close knowledge about the prescribed subject to get into the top rank list. It is very important to have a thorough acquaintance with the syllabus. Candidates must take as many Mock Tests as possible. Time management is important as in the Kerala PSC exam pattern, one will get only less than one minute for answering one question.